Radical changes are under way in Uzbek agriculture. Large agricultural companies that replaced collective farms of the Soviet past are being divided into small farms on orders from the national leadership. Supervised by the state and hurried along by the administrative apparat, the process is actually as swift as the notorious collectivization was in the 1930's. Media outlets report that small farms have already replaced large agricultural companies in most regions of the country. Official estimates show that the number of small farms in Uzbekistan is rapidly reaching 200,000. Something unprecedented in Uzbekistan, this new trend cannot help raising questions. What effect will the change have on the shape of the agricultural sector in general? Is the change progressive? How progressive, if it is? Here is an interview with Nigara Hidoyatova, Executive Secretary of Ozod Dehkonlar or Party of Free Peasants. Nigara Hidoyatova: Farmer in Uzbekistan is different from a capitalist one in the West. They are absolutely different. Forcing this institution of farming on the country, the Uzbek leadership maintains that this is a road to free enterprise in the agricultural sector, that this is some sort of magic wand that will reorganize the sector and boost its productivity. It is not. The institution is being set up by administrative methods, under the law dated April 30, 1998. This law proclaims establishment of farms as independent economic subjects operating in the agricultural sector. That's great but the law then specifies that these "independent economic subjects" operate on the land they lease. The very term "farmer" in the meantime implies independence and ownership of land. It is tenant farmers who lease land. No need to explain the difference between owner and tenant, is there? 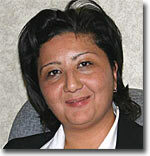 Farmers are supposed to lease land from district hokims [heads of district administrations - Ferghana.Ru]. The law states that hokims should base their decision on whatever the contest jury decides but the juries are but a decoration, nothing more. It will never occur to anyone on the jury to challenge the hokim who is essentially the only decision-maker. Our hokims got lucky when the president provided them with such a cornucopia! A reward for loyalty of course. Leasing the land, farmers pledge to maintain high labor productivity and provide impressive yields. The pledge goes into the contract. This administrative measure means that the farmer essentially keeps working for the state. It is different in the West where the market principle of demand and supply is farmer's only guideline. In theory, farmer's rights and obligations are defined by the legislation. In practice, however, we do not have any such legislation in Uzbekistan. It means that absolutely every law, even the Criminal Code, may be used against farmers. Last but not the least, the contract includes the clause stating that the land in question must be used for the specified purpose only. That's the final blow. It means that farmers are told in no uncertain terms how they are supposed to plough, what they are supposed to cultivate, when to harvest the crop, and how much of it to sell afterwards to what buyer and for what. The land cannot be bought, turned over to someone else, subleased, mortgaged, etc. And even that is but a tip of the iceberg. Petrol prices account for one fourth of tenant farmer's revenues. AI-80 petrol price went up to 585 sums ($0.5) on November 8, and diesel fuel is almost as expensive. An average medium-sized farm uses up to 2,000 liters of fuel every year. It means almost 1 million sums. Electric power is horribly expensive - 37 sums. All over wealthy Europe it costs three cents, and do not forget the difference in income! Uzbek farmers have found themselves in a vicious circle formed by state extortion, sky-high prices, and abuse of power on the part of the authorities. Whoever has decided to lease land from the state lives in constant fear that it will be confiscated any moment. The situation is particularly bad in rural areas where the local authorities know no control whatsoever and where cover-up is total. Regional and district hokims are but a small part of a colossal army of agricultural officials - corrupt and unscrupulous. They have - and use - every opportunity to rob farmers. Just try to complain against violation of the contract or unbearable corruption. Criminal charges will be pressed so fast you'll never know what hit you. If you are lucky, they will only take away the land. The situation tenant farmers are in cannot help having its devastating effect on the land itself that becomes infertile. Sixteen percent of villagers throughout the country lack drinking water where they live. Electric power is not always available even in cities, not only in rural areas. That's because Uzbekistan did not build a single new power plant in the last 15 years. All information on the actual economic shape of the country is classified. As far as the authorities are concerned, the population does not need to know facts as long as it is literate enough to read the slogan "Uzbekistan is a country of the great future". Still, this is not something that may be kept a secret. Everybody sees utter failure of the reforms and emptiness of the promises. The authorities are but wasting their time trying to conceal the obvious. The administrative-destructive methods are rapidly exhausting the resources. Our people can realize itself only in democratic society, one that guarantees fundamental human rights. That's what make democratization of society the first priority. Democratization is a must if the people of Uzbekistan is to have a decent future.